Many modern-day parents rely on screens to get through the tasks of daily living. Not only do most of us use some kind of screen for work, but we also use them for our personal lives, too. We rely on our phones 24/7 to do everything from banking transactions to seeing a doctor virtually too, of course, entertainment. And for those of us who are parents, screens have definitely become an integral part of our children's lives. Just this past month, I relied on digital alphabet flashcards to help my son prepare for his kindergarten testing. In small, focused doses, screens are definitely a go-to resource in my parenting toolbox. But the safety of screens for our kids is always in the back of my mind. What are the long-term effects of screens? Do we know enough about how they impact our kids' brains yet? How can we be sure they are OK to use? Well, new findings from the 2017 Pediatric Academic Societies Meeting have found that screens may pose a risk for speech delays for toddlers. 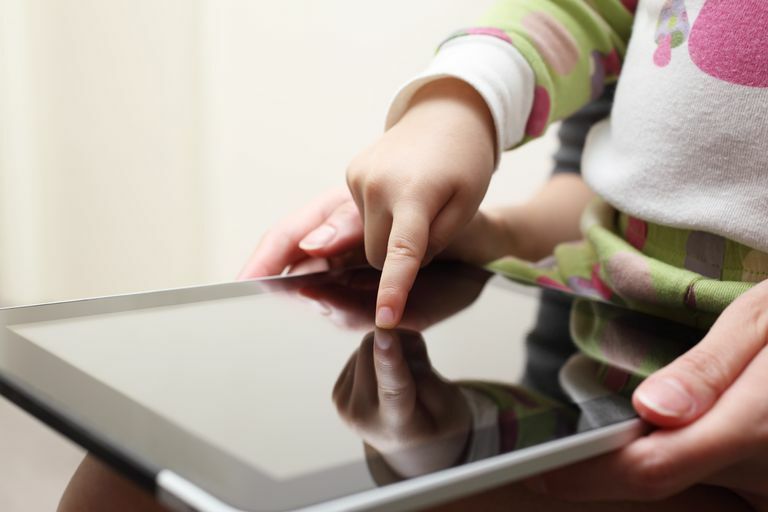 In a special study that was presented at the Pediatric Academic Societies Meeting in Toronto, researchers revealed that there is a link between handheld screens and toddler's speech and language development. The study looked at 894 children between the ages of 6 months and 2 years old for a span of over four years between 2011 and 2015. Based on the parents' assessments and recordings, the study revealed that by 18 months old, many of the children (20 percent) used a handheld device for at least 28 minutes everyday. Handheld screens included anything from childhood learning tablets to smartphones to regular tablets, such as iPads. Researchers suspected that there may be a negative association between speech and screens and they were right. They found that the more time the toddlers had on a handheld screen every day, the higher the risk the toddler had of exhibiting a delay in expressive speech. The link was actually tied to time increments. So, for example, for each 30-minute increase in the screen time, there was a 49 percent increased risk of expressive speech delays. However, the screen time was only tied to speech delays and did not affect any other way of communication. For instance, toddler screen use was not tied to any type of delay for social interactions, body language, or gestures. The screen use only seemed to affect expressive speech, which means verbally spoken words. "This is the first study to report an association between handheld screen time and increased risk of expressive language delay," noted pediatrician Dr. Catherine Birken, MD, MSc, FRCPC, the study's principal investigator. Other experts note that the findings support that more research is needed to fully understand all of the ways that screens impact toddler development, especially in terms of language. The American Academy of Pediatrics has revised its guidelines for screen time for children over the years, as technology has changed and become more integrated into our everyday lives. The way families used to just sit and watch TV has evolved to include screens in a lot more situations, and the AAP has had to base their recommendations around the changing screen technology. The AAP's current guidelines for screen time for toddlers states that all screens are discouraged for children under 18 months, aside from video chatting with family and friends. For children 18-24 months, parents are encouraged to use high-quality educational programs and apps with their children, because evidence shows this is how toddlers learn the best. The AAP also discourages the use of all unsupervised media for toddlers. So in terms of this study, although the AAP has strong recommendations to limit screen time for toddlers, they have not published an official policy against all screen time. Instead, they encourage all families to develop their own "Healthy Media Diet" to introduce and incorporate digital media in a healthy way. Obviously, eliminating all screens for all of childhood is unrealistic. However, this study is another strong indicator that there is still a lot we don't know about when it comes to how screen time affects a toddler's developing brain, especially when it comes to speech and how it will impact their ability to communication long-term. Talk to you own child's pediatrician to understand your child's risk for any possible speech delays and work together to develop a healthy digital media plan for your family.